This year I was lucky enough to find Pumpkin Spice M&Ms at Target. If you can't find them at the store, you can find them online here. I love pumpkin spice and chocolate together, so these were perfect for me. I also love the combination of pumpkin spice and maple syrup. I made sure I packed a few cans of my dad's maple syrup. I'll stock up again when I go home for the holidays. I don't know what I would do if I run out of maple syrup. This recipe is based off the Pumpkin Dulce de Leche Chocolate Chip Cookies that I made at the beginning of the year. I like how soft and puffy those cookies were. I just swapped out the dulce de leche for maple syrup,changed the cinnamon for pumpkin spice, and added some Pumpkin Spice M&Ms. One thing I did learn making these cookies is that these M&Ms are very sensitive to moisture. In first batch, I mixed them into the batter and all the color washed off into my cookie batter. That made for some pretty ugly cookies. So the second batch I placed the candies gently on the cookies before baking them. The color only spread a little bit. This made for much prettier cookies. 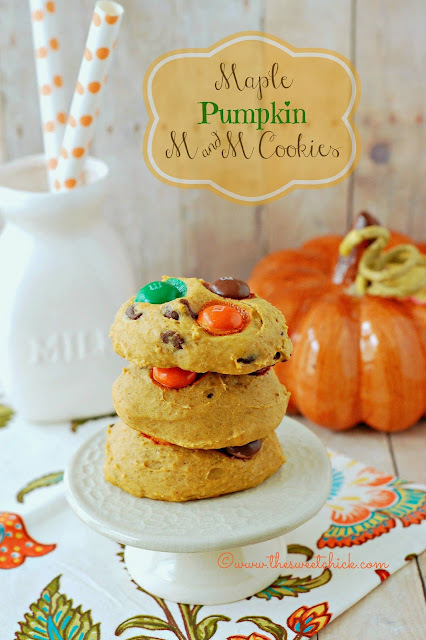 These cookies had just the right amount of pumpkin spice and maple sweetness, and plenty of chocolate in every bite. The Pumpkin Spice M&Ms just enhanced all the flavors. In a stand mixer add butter, sugar, egg, maple essence/extract and maple syrup. Beat on low until well mixed and texture is smooth. In a separate bowl combine flour, pumpkin spice, salt, baking powder and baking soda. Stir until all is well blended. Then add the pumpkin puree and give it a good mixing. Using cookie scoop, drop by scoopful onto a greased cookie sheet leaving two inches between each dough ball. Place three M&Ms onto each dough ball and gently press down. Bake for 10-12 minutes or until the tops are slightly golden. Remove from the oven and wait 5 minutes, then remove from cookie sheet and place on cooling rack until completely cooled.